Russell Woolf and the ABC Drivetime program did a live broadcast from Fremantle‘s Kulcha on Friday in front of a packed house. The theme was NAIDOC week and the Bartlett Brothers from Derby entertained the crowd with their music. Tomorrow the opening of NAIDOC week will be at the Hilton Community Centre in Paget Street from 3 pm, so come along! Last evening at Kidogo Art House at Fremantle‘s Bathers Beach was very special. Kidogo had two experts talking about Mary Ann Friend, who probably painted the first impressions of Fremantle, the Swan River Colony, in 1830 and included them in her journal. The journal will be auctioned by Christies in London later this year and is expected to sell for a quarter of a million dollars. The cosy gallery space was packed with people and the talks by Christies director Nicholas Lambourn and Notre Dame University historian Deborah Gare were fascinating, as they transferred us back in time to the lives of the early settlers. It was made even more special when the realisation came that the waves we heard breaking were the waves the early settlers would also have listened to while camping out near Bathers Beach. Deborah Gare has the amazing talent of making history tangible. It was an absolute delight to listen to her, and walking away feeling we knew so much of Mary Ann Friend when we left the gallery. If your children are not interested in history or think it is boring, let them listen to Deborah for 15 minutes and they will change their mind. Well done to Kidogo for organising this event. It was great! It was verbal high-fives all over at last evening’s City of Fremantle full council meeting, with everyone delighted about the announcement that the Department of Housing will move their offices to Fremantle. The officers involved in securing this coup definitely deserve praise. Councillors alo praised the efforts by the CODA architect group on their plans for Kings Square, with Mayor Brad Pettitt calling it inspiring, while councillor Jon Strachan called it a fantastic outcome. Of course much of what Kings Square will be depends on what the Sirona Capital development of the Myer and Queensgate buildings will look like. That will have a massive influence on the city square. The proposal to seek expressions of interest to create an art hub at Arthur Head was also passed, but after some important amendments. I have no idea how committees and officers communicate, but going by last night it needs improvement. While the officer’s proposal calls for overall management of Arthur Head, including buildings, councillors only intended it to be for the management of users and activities. That is a major difference! I don’t blame the officer at all, as this was obviously a case of bad communication from the Strategic Planning Committee. Officers are not mind readers councillors. Good to finally get the confirmation that Bathers Beach and Kidogo Art House are part of Arthur Head and included in the plans for the area. An art hub at Arthur Head hey. There is already one there, called the J Shed. But why does Arthur Head not work? Because it has never been marketed as a destination by the City of Fremantle. New precinct signage that will be introduced later this year again fails to include Arthur Head as its own precinct and destination, and it is simply included in the West End precinct. Signage to Arthur Head and the J Shed art hub have been bad, and so is signage linking tourist destinations. Visitors at the Maritime Museum have no directions on how to get to the Round House, while up at the Round House there are no signs to the Maritime, and Shipwreck Museums, the Fishing Boat Harbour, or Fremantle Prison. The City is now proposing to make a theme park out of Arthur Head, where artists will interact with visitors. It’s a bit like the old village at Armadale approach, so let’s hope we won’t get people walking around in historical costumes, and blacksmith demonstrations on how to make horseshoes, and glass blowing, etc. With a high influx of Chinese visitors expected in the next years, has CoF done a survey on what they would like to be offered in Fremantle? Cute art hub destinations are pretty much seventies stuff, so why does the city want modern forward looking development in the city centre, while going backward at Arthur Head? A huge parcel of land at Leighton Beach in North Fremantle has been put up for sale and could well become a high density residential development in the near future. It is one of the biggest land holdings in the western suburbs on 1.68 ha of land. It is the land just south of Beachside Leighton, with the boundaries being Bracks and Irene streets and Walter Place, well withing walking distance to the North Fremantle railway station. The land is currently zoned industrial, so it would need to get its zoning changed to residential, but in the current climate in Western Australia and Fremantle of wanting to develop, that might just be a minor issue. It is not often that we see our handsome Fremantle Mayor Brad Pettitt sitting on a bench at Kings Square sipping French champagne, but that was the situation this morning. I first thought the Mayor had had a night out on the turps and was curing his hangover the French way, or he had a broken heart, or worse even, midlife crisis had struck. He is 42 after all. But sneaking up closer I heard Brad’s rhythmic chanting Housing, Housing, Housing,……and noticed the deep smile of satisfaction on his face. After hours of research I finally discovered what this was all about. The Department of Housing have indicated they want to move to Fremantle and are interested in the Point Street carpark site to move their troops to. This of course would be the coup Fremantle council has been waiting for, and it would change the Freo landscape drastically. It would be great for retail as well. We here in Freo have great affinity with the Department of Housing of course. They managed to vacate the Henderson Street Warders Cottages and let them slowly rot, they also vacated the Vale Street Homeswest units, without knowing what the future for the area will be. This is made even worse when we read in the West Australian today that the waiting list for public housing has now blown out to more than two and a half years!! While Fremantle would welcome a government department in the inner city, it is disturbing that the State Government has money to move public servants into better offices, but can’t look better after those in desperate need of affordable accommodation. Maybe the Point Street site could become a mix of Department of Housing offices and affordable units? FREO AMALGAMATION BOUTIQUE OR DISASTER? Good post by Michael Swanepoel on his blog The Fremantle Doctor about what amalgamation would mean for Fremantle. As always it is well worth reading the wise words of this young strategic city planner. Comments Off on FREO AMALGAMATION BOUTIQUE OR DISASTER? Come down to Moore & Moore Cafe in The Moores Building on Saturday 7 July 2012, grab your free drink, have a great night out and help us make Fremantle more cycle-friendly! We are holding a fundraiser, with the support of our partners at The Fremantle Foundation, with all proceeds going towards the construction of a bike shelter somewhere in Fremantle… hopefully near the Fremantle Markets!!! Live Music – Jazz and Blues! Live Art Show – Famous Artists Painting Live to Music! Ian De Souza has a talent for capturing rythm, colour, movement and raw energy, featured in international exhibitions – will be running 8-10 artists on his easel. Ian organised the hugely successful 9 day art project called ‘Drawn Together’ at The Moores Building in 2010 which opened The Fremantle Festival. David Giles will be running 6-8 artists on his easel. David is the patron of The Freedom School of Painting which is a highly coveted and professional development and mentoring program for artists. Emma Margett has been involved in a number of inspiring community projects. She also teaches art to youth at TAFE, and she is also responsible for the amazing artworks around Moore & Moore Cafe. The artworks created on the night will be displayed at Moore & Moore Cafe in the weeks following the event and sold at auction with the majority of proceeds going towards our project to make Fremantle more cycle friendly. Kieran Wong from Fremantle architect group CODA presented the Kings Square Strategic Plan at the City of Fremantle on Monday. It will go to Council for consideration on Wednesday. From my first impressions a lot of what CODA suggest makes sense. They clearly listened to the community during workshops and the so called Citizen Jury. One of the major changes would be a naked street approach on Queen Adelaide and William Street and also at Newman Court that would be opened for cars and parking again. The naked street concept is sharing of roads between pedestrians and cars with pedestrian priority. This has been working very well in countries like the Netherlands. The second major change is an emphasis on the two triangles Kings Square is made of. St John’s triangle would be cleaned up and made more legible with some trees removed and others added, while the Town Hall would become a stand alone feature and a new civic centre built in a triangle approximately in front of where the entrance to Myer is now. In between CODA would like to see a Civic Room, a place for people to gather that could be partly under cover. A suggestion by Cathy Hall that it would be beautiful to reinstall the verandas at the Town Hall is something I strongly support and I hope Heritage Architect Alan Kelsall will make this a priority and start applying for funding from Lottery West, etc. immediately. Overall the changes suggested by CODA feel like a real improvement to make Kings Square into our civic square, so let’s hope the City can afford it financially. The NAIDOC week celebrations start in Fremantle this Sunday, July 1 with a flag raising ceremony, dance, music and food at the Hilton Community Centre in Paget Street from 3 pm. 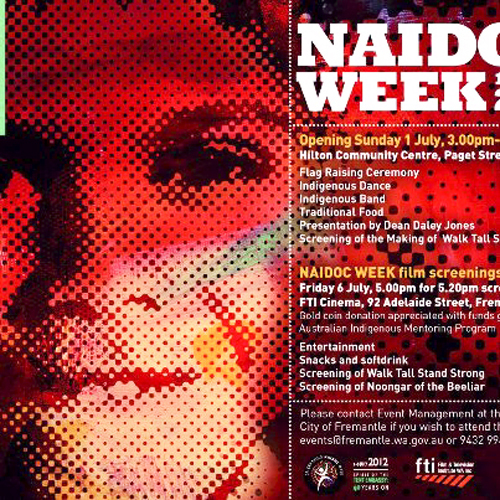 There will also be NAIDOC film screening at the FTI on Friday July 6 at 5.15 pm. Shown will be Walk Tall Stand Strong and Noongar in Beeliar. Come along and support our indigenous people! Saturday’s presentation at the Workers Club by Fremantle councillor Rachel Pemberton about the placemaking workshop she attended in New York, raised a few questions in me and people I had a chat with afterward. Placemaking has been a buzz word in Fremantle for some years now, with expert David Engwicht flying over for workshops a few times. Place making, as in a very deliberate and creative approach to changing a space or city, should be welcomed. Even more so when it involves the community and creates debate on how and where. But how do we do placemaking best? Should different departments all have their own way of placemaking, or should the city create the position of a Manager of Placemaking, so that person will have an overall view of all aspects of placemaking all over the city and can coordinate it? Rachel mentioned that in New York the workshop people advocated that it is better to make small mistakes than big ones, meaning placemaking should be introduced step by step rather than on a large scale. I agree with that and hope the City of Fremantle will take that approach to the changes they want to make at Arthur Head. Start with the creation of a cafe/wine bar/art gallery and leave the rest in peace, till we see what enormous change such a small change would bring. Take it from there to make additional improvements if still needed and wanted. To continue with placemaking, I am surprised the City is calling for expressions of interest for the creation of a Nyoongar art work for Kings Square ahead of the outcome of the community consultation for our city square. Why not wait until we have seen the plans and know where buildings will be demolished and others erected, so we know what space is available for such work. A major public artwork for Kings Square should be site specific. I am very much in favour of a significant Nyoongar art work in the inner city, but let’s wait a bit till Kings Square is ready to embrace it.